Gov. Dannel P. Malloy talks with reporters Friday. Gov. Dannel P. Malloy has vetoed legislation that would have loosened the state’s affordable housing standards. It is Malloy’s first veto of the session. The bill would have modified the state’s 8-30g law, which pushes – but does not require – all municipalities to have 10 percent of their housing stock deemed affordable. Until that threshold is reached, developers building affordable units are allowed to bypass local zoning laws, which has led to resistance and backlash from some municipalities, many of them suburban. This legislation would have made it easier for cities and towns to reach the threshold necessary to halt unrestricted development by qualifying for multi-year moratoriums. It received wide bipartisan support in the General Assembly, passing the House by a vote of 116-33 and the Senate 30-6. The vote margins in both chambers were wide enough to override a governor’s veto. House Speaker Joe Aresimowicz, D-Berlin, said he expects the legislature to consider taking up an override. Adam Joseph, a spokesman for Senate President Pro Tem Martin M. Looney, D-New Haven, said the Senate Democrats would not begin considering which bills to bring up in a veto session until after the governor has signed or vetoed all legislation sent to his desk. “People in Milford and across Connecticut have been calling for common-sense reforms to our affordable housing statutes, and I am deeply disappointed that Gov. Malloy has chosen to ignore them,” Slossberg said. “The governor’s veto message shows a real lack of understanding of the specific workings of this statute and of the need for reform. 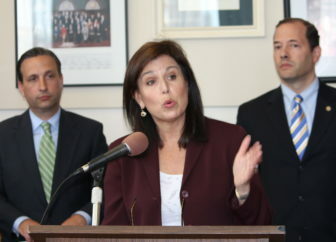 “Connecticut is the only state that allows private developers to site their developments wherever they choose. States that do not give this disproportionate power to housing developers have been much more successful than Connecticut in developing affordable housing,” she added. “I consider this an outrageous move by the governor,” Frey said. “The bill he just vetoed was the product of bipartisan discussion and mutual compromise, and it took hard work to pass the House and Senate as broadly as it did. “If the governor won’t accept the careful and prudent ideas in HB 6880 to provide fairness and contemporary changes to the 8-30g statute, then he has truly given up trying to help municipalities. I’m really not sure what else we can do to get his attention about how serious of a problem this is,” he added. Sen. Douglas McCrory, D-Hartford, said in a statement included in Malloy’s news release that he stands by the governor’s decision. “I had serious concerns with the potential for this bill to reduce access to safe and affordable housing for thousands of Connecticut residents, so I am happy that the governor vetoed it,” he said. Outside the legislature, the decision received praise from advocacy groups fighting homelessness. Two of the state’s largest groups – the Partnership for Strong Communities and the Connecticut Coalition to End Homelessness – applauded Malloy’s veto in a joint statement. “A larger supply of affordable homes is essential for maintaining Connecticut’s progress in fighting chronic homelessness and ending homelessness for families with children by the end of 2020 – our current statewide goal,” it continued. 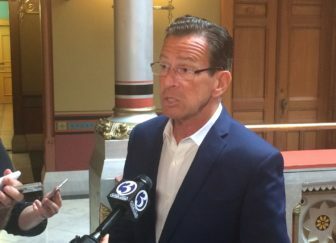 The Regional Plan Association, an urban research and advocacy organization that operates in New York, Connecticut and New Jersey, also voiced its support for Malloy’s decision. “If Connecticut municipalities don’t create more housing for more people, they will continue to face shrinking grand lists and increasing property taxes. This isn’t a sustainable trajectory for individual communities, and over time it will critically compromise the state’s already faltering economy,” Kaplan-Macey said.